A to scale rendetition of the AAA map of Atlanta, my client lives near one of the lakes. I wanted to make something special for him. The concept is that we all belong somewhere and a map graphically shows us where. My clients shadow is quilted with his heart being near his home in thin grey thread. Constructed of new and recycled silk and antique kimonos. 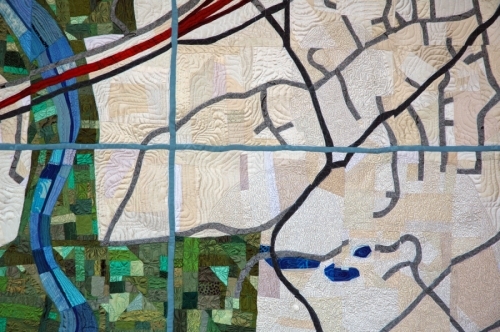 Detail of all silk Map Quilt sewn out of new and recycled silk. The leaves are made out of a wrinkled strong Japanese paper and I cut out and paint each one. I sew the veins on the leaves with my sewing machine so that the stitches leave lines of texture. 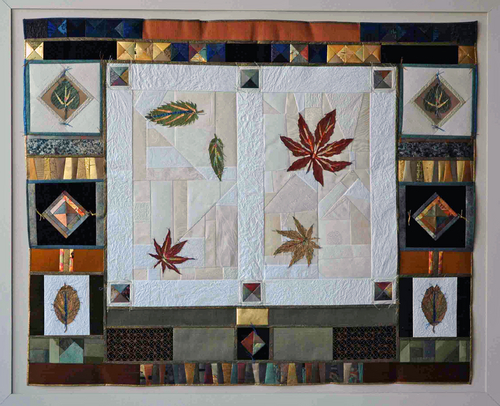 This is one of the largest Leaf pieces I have done and it has new and recycled silk, bronze leaf and some wonderful silk prints from thrift store dresses. Collection of Mayo Clinic, Minnesota. 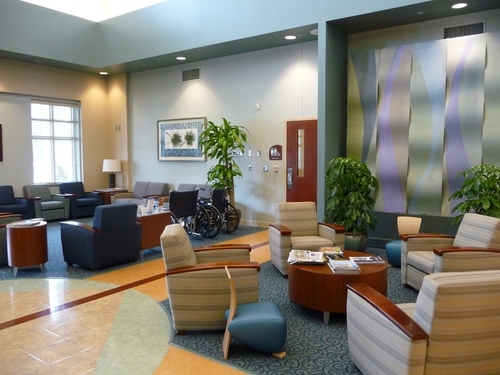 This commission for Regions Hospital, St. Paul, Minnesota is to update a tired chapel with a whole new look so workers and patients and family could all have a place to spend a quiet medatative moment. Many religions use this space, so a design that was more universal in style was desired by the client made using their custom colors. 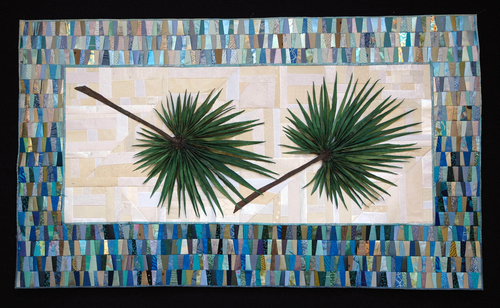 This special quilt was done in the client's custom colors for a lobby of a hospital. It is framed under glass and mounted on linen. 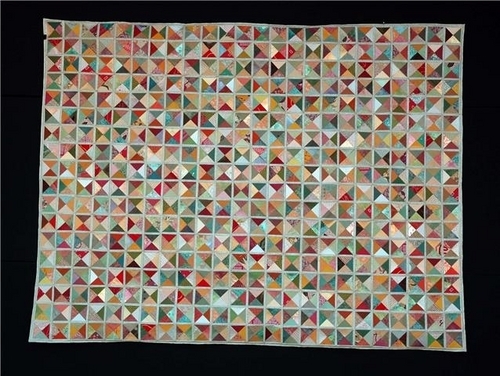 It is a variation of an old classic quilt design called "broken dishes" or "X blocks". It is a classic design which is both contemporary and traditional at the same time. I selected earthy bright greens, saffron and bright yellows and rich warm oranges from my stash of silks and papers. There were quite a few kimonos which were in the right colors for this commission, including one which is tiny wooden Japanese dolls that I love. I also painted papers for this commission. Blocks are cut at 2 3/8" and the strips between are cut at 1/2" and sewn with 1/10" seams. Commissions are available in any size and colors. This piecework of mixed materials was the first done as a commission for a private client in Atlanta. It is made of blocks which are cut at 2" and the strips in-between are cut at 1/2" and sewn together with 1/10" seams. The papers and silks are ironed flat. I estimate that there are around 3,900 pieces in this, with the smallest being around 1/4" square. Careful attention was paid to the colors and intensity as the rows progress through the stages from pure white to black. 24"H X 72" D each. Included in "500 Quilts" book. A closeup showing the size and detail of the blocks. These blocks are cut at 2" square and the strips of paper between are cut at 1/2". The seams are sewn at 1/10" and turned underneath and ironed. I paint on the paper as it goes through the transition of colors from black to white. Sewn Japanese papers, wrapped and glued around museum board and placed on dowels of different heights. This gives the whole piece a floating dimensional feeling. Available any size and colorway for commissions. Call Artist. Commission bythe City of Atlanta for Grady Memorial Hospital. Silk fabric, mostly dupioni from India with a mixture of a few other solid silks. A raw silk outside border is used with sheer silk shaped patches to emphasize the patterns sewn in the border. The dimensional cancer ribbons in the center have some Japanese bronze leaf on the inside. This is the largest quilt I have done so far and it was a totally directed commission by the client. 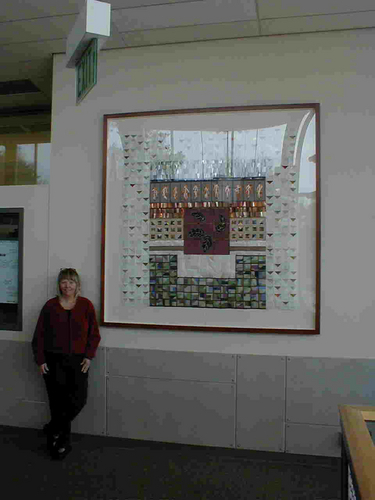 It was an interesting project that was hung in the two story lobby of the new Cancer Center. Japanese papers, silk (new dupioni and re-cycled kimono and thrift store dresses), 23K pure gold leaf, Japanese bronze leaf (metal) which has been chemically patinated colors and varigated German bronze leaf. 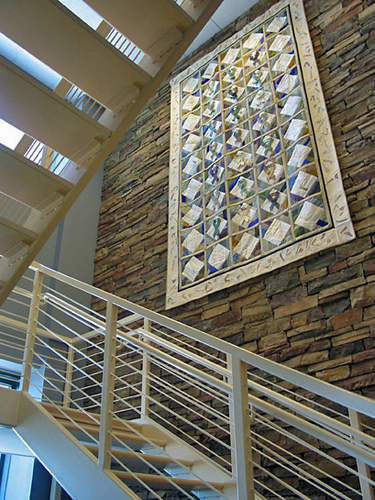 This large quilt which has been framed under glass hangs in the upper lobby of the State of Georgia Public Health Laboratory. It was commissioned to enhance the public area of a very contemporary building. 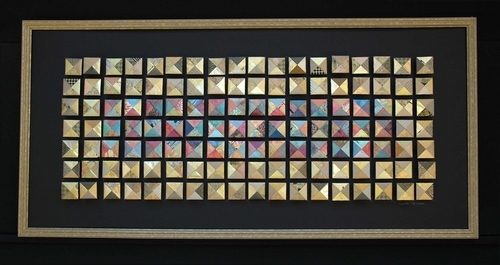 I worked with the Architect to include the metals and the colors which he had used on the project. Copper was an important color to bring out a warmer feeling in the building. This commission was done for Hardwick CPA, Atlanta, for their entrance Lobby. It is comprised of 4- 24" x 24" frames which each have 49 sewn blocks raised up on dowels cut and glued at different heights. I call them "Blocks on Stilts". 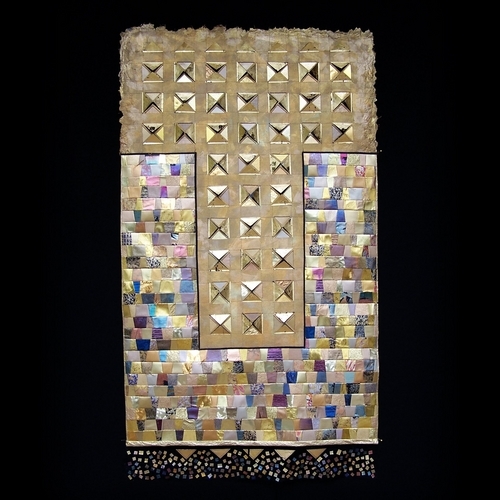 The blocks are sewn japanese papers, pure gold and bronze leaf (thin metal) and new and re-cycled silk from old kimonos and thrift store dresses. I also use new duppioni silk from India in as many colors as I can find, as that is my favorite silk. A gridwork is drawn to aid in placement of the dowels. Wonderful light patterns are formed when spotlights are focused on the blocks. They must be framed under glass in a deep shadowbox frame. Any size or colors are available for commission. Different framed components could be arranged in large or odd spaces. Many block patterns could be done. Collection of the City of Chattanooga, Mayor's Office, Chattanooga, Tennessee, 2008. Handmade and painted cotton paper linter. Painted with several colors of gold. 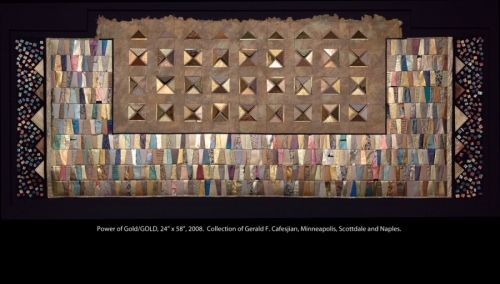 The upper "T" shaped paper has 79 triangles of pure 22K gold leaf (metal) sewn to the surface with equal numbers of triangles cut, glued and applied underneath the surface. There is a black triangle sewn underneath each triangle on the surface to give it added depth. The bottom "U" area is comprised of a variety of metallic Japanese dollmaker's papers which are sewn together. Bottom is comprised of 1/4" pieces of gold leaf sewn to acrylic painted cheesecloth. This visually allows the "confetti" to float across the bottom of the frame. This is the first large dimensional Blocks piece that I did last year. It is made of Japanese papers, new and re-cycled silk and hand painted papers. They are sewn and then wrapped around 2" squares of museum board and mounted in a grid of 2 1/2" on wooden dowels cut at various heights. The overall piece is framed in a deep shadowbox frame with glass. Spotlights throw wonderful shadows on this piece. Available for commission in any size combination or colorway. 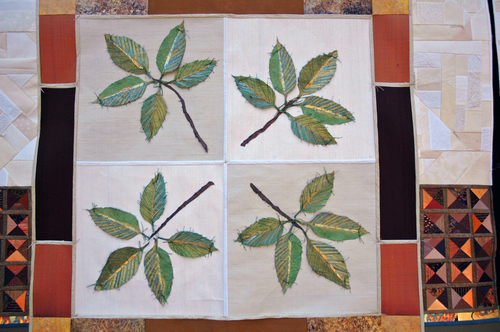 The Chestnut leaves are cut out of Japanese paper, then painted with acrylic paints. The veins on the leaves are sewn with thread and oftentimes the main veins are thin strips of pure 23k gold leaf with stitching on the top. There is often overpainting on the thread. 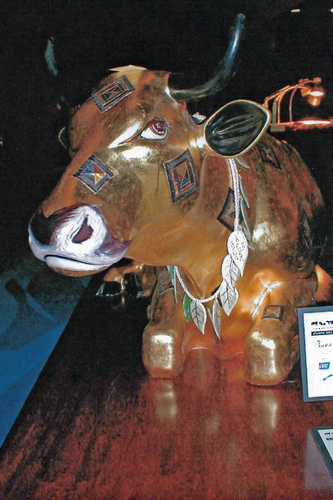 Cow Parade - Atlanta was one of 13 international cities participating in the fundraising benefits and auctions with local artists chosen to decorate their own cows. Amazingly enought they are hollow and will fit in a minivan and can be easily carried by one person. Acrylic paint, gold leaf (bronze imitation gold leaf), Japanese bronze leaf and Japanese papers. Hand carved wooden leaves painted and patinated for the cow's necklace. The paper pieces were first sewn and then applied to the fiberglass cow. The cow was then given three layers of red gold leafing paint and glue sizing. The gold leaf was applied, buffed for shine and three coats of varnish for durability. Unknown owner. Exhibited in Olympic Park, Atlanta, Ga. Summer 2003. 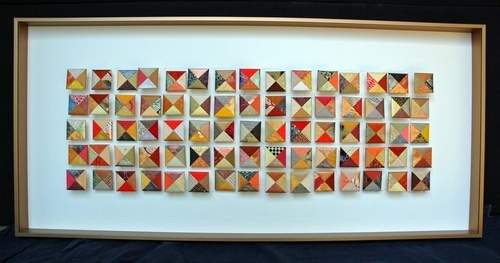 Sold at auction Fall 2003.
paper construction framed under glass. 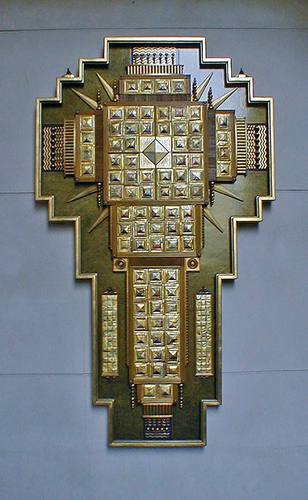 A gift for the Monastery of the Holy Spirit, Conyers, Georgia. This cross has its foundation on a 170 lb. wood frame. It was done in collaboration with artist and woodworker Leslie Boan. The center section is the same sewn Japanese papers as in my other work but it is inlaid into plaster and pressed as it hardens. 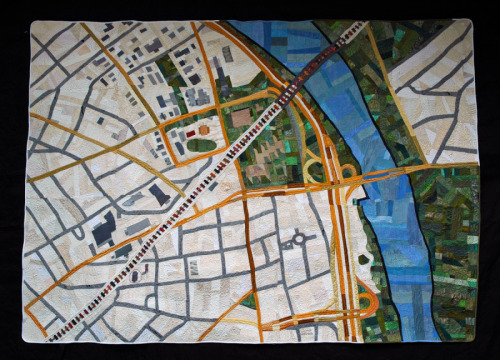 This was an experimental process that resulted in piecework sewn papers resembling mosaic. Many of the surfaces are faux finished with acrylic paint and wooden pieces are gold-leafed with bronze leaf from Japan or Germany. 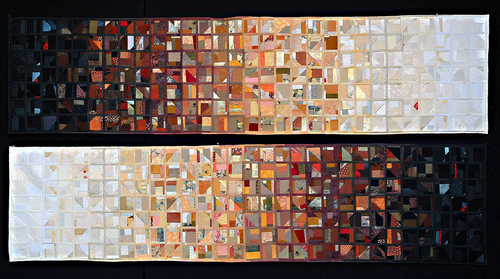 Sewn Japanese papers, new and recycled silk and pure 23K gold leaf. Center is acrylic painted cotton heavy paper which has triangles sewn on the surface and cut into the back. Initially this series was inspired by a box of Godiva Chocolate and my second trip to Japan. Collection of G. F. Cafesjian, Minneapolis, Mn. This commission was done for Parc Nicolette Hospital in Minneapolis, Mn. in 2008. Custom colors were chosen to give the triptych a feeling of lightness, spring and water. Sewn Japanese papers with new and re-cycled silk and gold and bronze leaf. Collection of Novartis Pharmaceuticals, Atlanta. 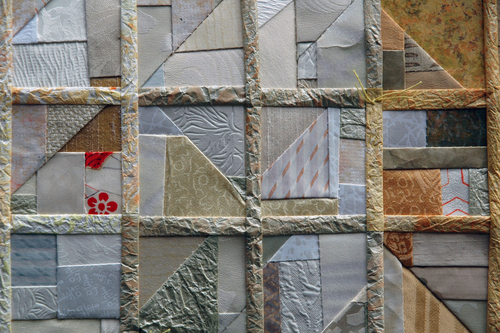 Japanese papers and new and re-cycled silk sewin in Victorian "crazy quilt" patterns in the white center. The leaves are cut out of paper and then painted. Embellishments, like the veins in real leaves, are added by sewing to enhance the reality of the leaf. The surrounding areas are sewn papste papers, which is made out of starch thickened paint with designs inscribed into the paper by tools. 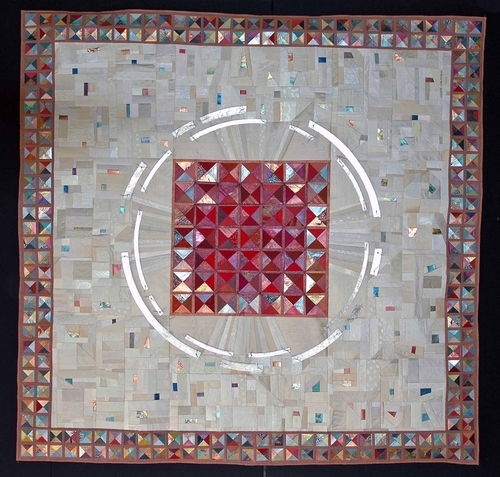 I also used hand loomed Indian dupioni silks and paint papers to add to my quilts. Collection of SunTrust Bank, Atlanta . A commission for Rutgers University. 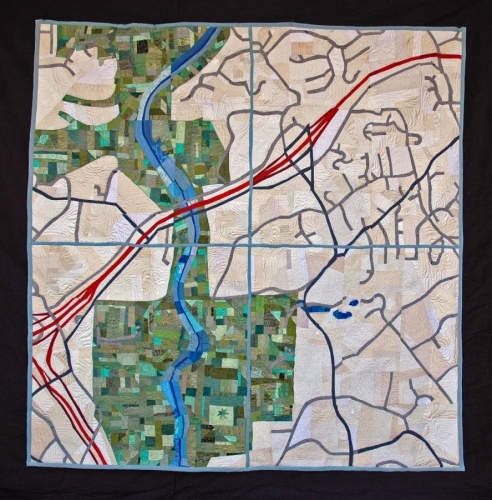 Sewn recycled silk from antique kimonos and thrift store dresses, this map is machine quilted and pieced. It represents a moment in time of the campus of Rutgers University. 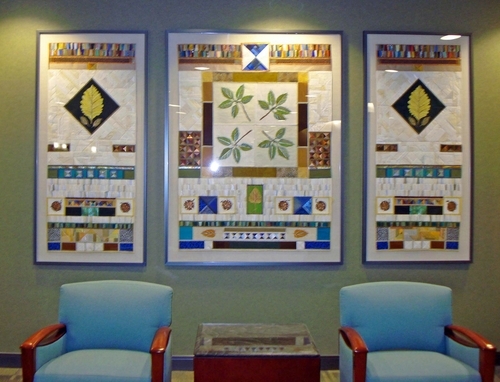 Hung in the Healthcare and aging Building located on Patterson Street. Maps are a concept to me. They show us where we have been, where we are going. They define our space in the world. Oftentimes they are beautiful abstract designs as seen from the sky. The water in them becomes a lifeforce of its own. 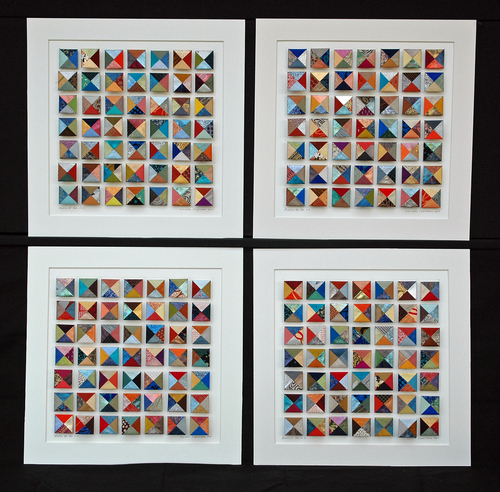 This series of work is available by commission. Hung on wall without glass although smaller pieces may be framed. About 4,000 pieces.